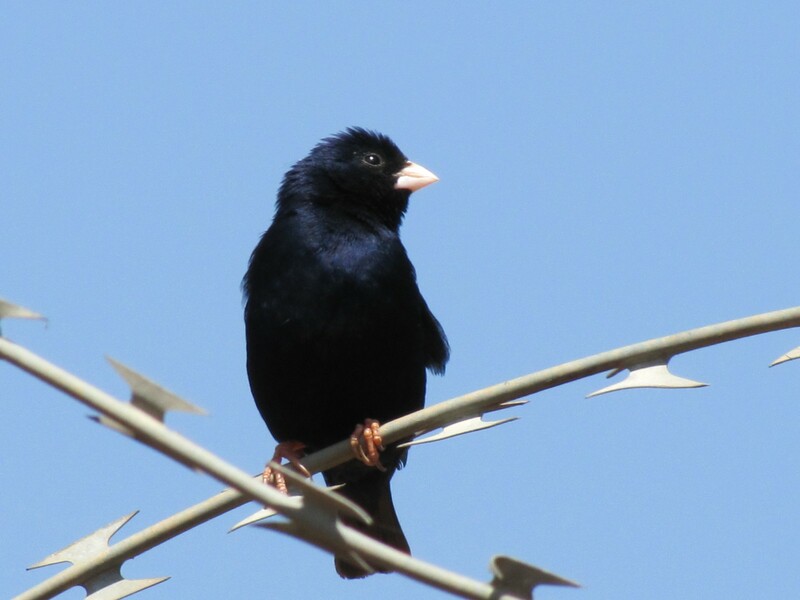 The Village Indigobird I saw in Addis Ababa, Ethiopia is quite a stunning bird. The black coloured male feathers literally glow in sunlight. Few black coloured birds are quite as brilliant in my opinion. The female – which I didn’t get a chance to photograph – is dull brown, similar to a female House Sparrow. 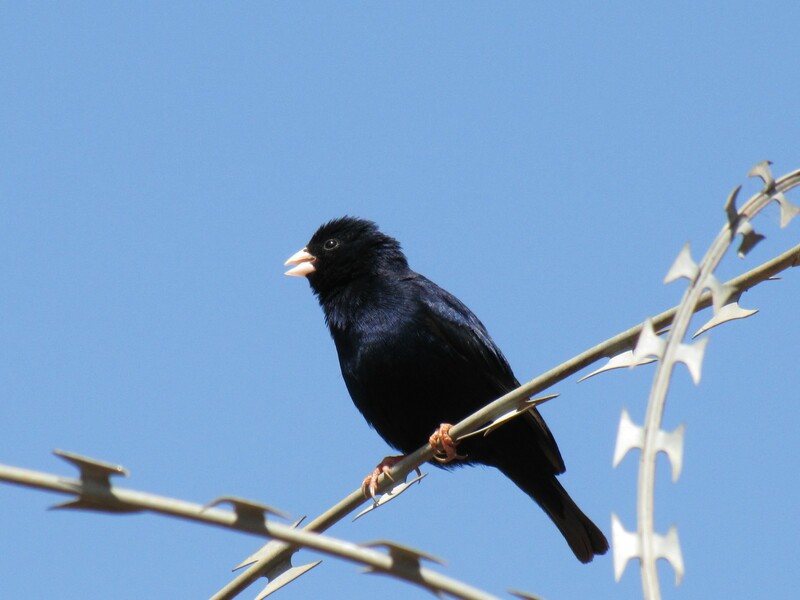 Village Indigobirds are found over a wide part of Africa south of the Sahara Desert. They are found in bushland, woodlands, cultivated areas and especially around villages – hence the name. Their principal food is seed, especially grain. Being parasitic, the female lays her eggs in the nest of the Red-billed Firefinch (click to see my previous post), so these two species are usually seen in the same area. 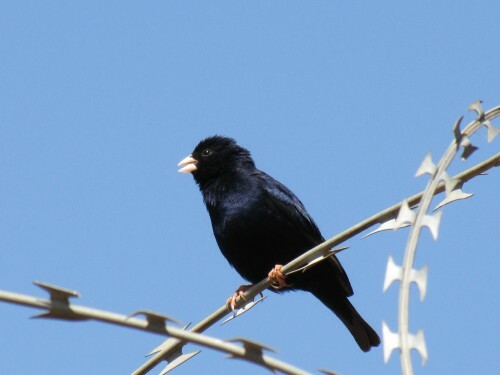 Unlike the cuckoos, however, the Indigobird does not remove the eggs of the host species. 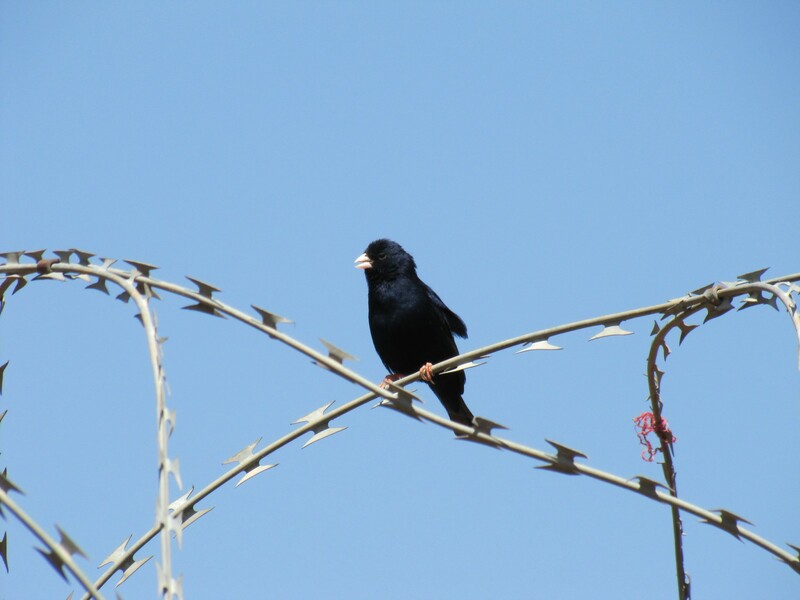 I should perhaps explain the presence of the razor wire in these photos. The photos were taken inside the campus of the international school, Bingham Academy in Addis Ababa where my daughter was teaching last year. The large school campus is surrounded by a high 3m wall topped in razor wire for security purposes. All visitors and students need to enter through a 24 hour guarded gate. While there have been no incidents that I am aware of, the administrators take security seriously. Enjoying the photos and blogs re the birds.